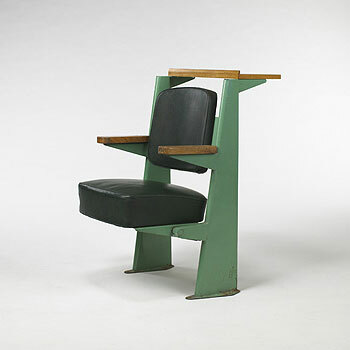 Prouvé designed sturdy but light-weight furniture from his earliest experiments in folded steel in the late 1920s. It became a core part of his business. 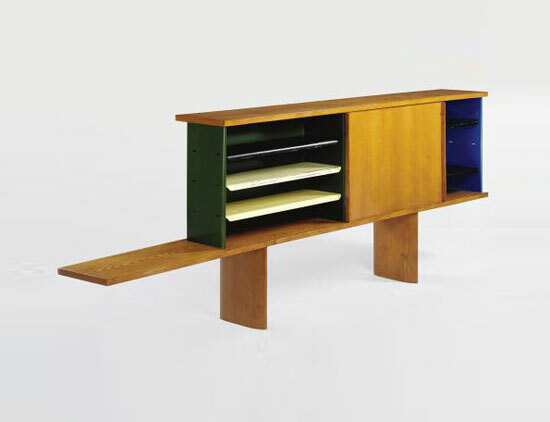 By 1934 he had a commission for 800 pieces of office furniture for the headquarters of the Paris power company CPDE. This made Prouvé a serious contender in the market for mass-produced furniture. He avoided the domestic market, in favour of the public sector — local authorities and government bodies — in the growing areas of health, education and administration. It reflected a social ideal but, with its larger orders, also offered the economies of scale. One secondary school in Metz ordered 1000 items, including beds, chairs and desks. 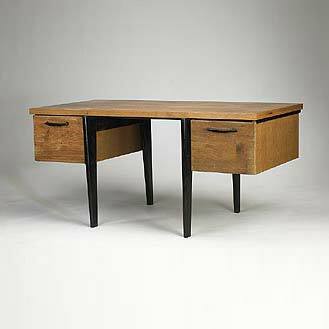 These successes led the company, in 1936, to produce a catalogue of standard models for hospitals, schools and offices. Prouvé lost control of the factory he established at Maxéville when his financial backer, Aluminium Français, took over in 1953. The loss was a huge emotional setback for Prouvé who had called himself ‘a factory man’, but it encouraged a new and fruitful phase in his creative development. Prouvé built himself a house using components salvaged from the factory. This unique house brought an end to the experimental phase in his career. From then on he stopped being a manufacturer and instead established a new business, Construction Jean Prouvé, that turned him into a designer. Construction Jean Prouvé was eventually taken over by CIMT, a maker of components for railway lines. Under Prouvé’s direction it became the leading manufacturer of light-weight curtain wall façades. When Prouvé left the business in 1966 he started a technical consultancy advising architecture on cladding design. This led to his work on the curtain wall façades of the Tour Nobel building in Paris’ La Défense and the development of the grid frame constructions used for petrol stations. In 1971 Prouvé chaired the architectural jury that chose Renzo Piano and Richard Rogers to design the Pompidou Centre in Paris.